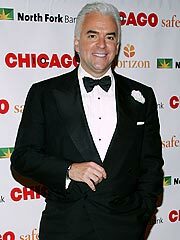 There is a pause on the end of the telephone line as John O’Hurley, breakfasting at home in Los Angeles, considers his answer. The question was a pretty tame one: “What did you make of Phil Mickelson’s win at the Open?”. But it provokes a Pinteresque pause that borders on the Beckettian silence. There is a lengthy intake of breath as the 58-year-old actor replays that astonishing final round at Muirfield last month in his head. Mickelson, five shots down at the start of the day, blazed a final round of 66, birdying four of the last six holes to win the old claret jug by three strokes. “It was truly amazing,” he says finally. “That was such an angry course and he was totally the master. It was probably one of the all-time great rounds. And you know, Mickelson is such a good guy, when he flew home his first stop was at the Callaway factory so that all the employees could touch the claret jug and get their picture taken. Golf and the movies. There have been plenty of occasions where the two have met from Spencer Tracey and Katherine Hepburn in Pat and Mike and Fred Astaire’s remarkable tap/swing combination in Carefree to more modern movies such as Tin Cup, The Legend of Bagger Vance and Golf in the Kingdom. And now O’Hurley, who is best known to international audiences for his role of J. Peterman in the television comedy series Seinfeld, finds himself preparing to add his name to those actors who have allowed their game to be committed to celluloid as he takes on the role of the villain in the Crete-set romantic comedy Swing Away. “I did an event at the Waldorf Astoria to mark 125th anniversary of the Saint Andrews club in Hudson and I met (creative producer) George (Stephanopoulos). “He is a very persuasive man. I read the script and liked it very much. It was well-written and had a nice tone. “I was very taken with the idea of the lead being a female pro and not a young kid but what you might call a grizzled old vet. I love the idea of her walking over and decking someone in the gallery. That script has come courtesy of the Greek-American Paul Lingas and the comedy veteran Steven Kampmann who is slated to direct. It concerns Nikki, a pro on the women’s golf tour who is suspended for hitting a spectator. To escape the media backlash she hops on a flight to Crete to visit her grandparents and rediscover her mojo in both golf and life. The climax features a golfing shoot-out that pits the villainous anti-hero played by O’Hurley against…well that would be telling just a bit too much. The original villain was to be a German but with O’Hurley coming on board that now looks likely to change to an American. “It gives a better box office value and I think a deeper sense of black comedy,” says O’Hurley who admits that he is something of a stickler when it comes to golfing credibility. In O’Hurley’s view Joel Gretsch (a five handicapper) produced perhaps the most authentic screen swing when he played Bobby Jones in The Legend of Bagger Vance while Kevin Costner struggled for credibility in Tin Cup. He is confident, though, that his own game will stand up to the scrutiny of a big screen audience. O’Hurley is one of those actors whose face and voice are better known than their name. 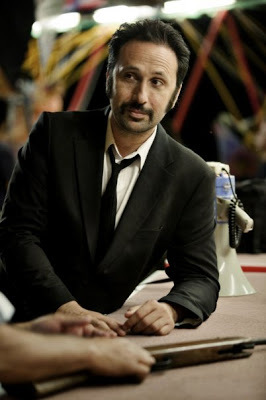 He has worked in sitcoms, done voiceovers (notably as King Neptune in SpongeBob SquarePants), he spent several years hosting Family Feud in the US, he has worked on Broadway, he reached the 2005 final of Dancing with the Stars and composes music for the piano, releasing an album with the cellist Marston Smith. Throughout all that, golf has been at his side, not just as a form of leisure but as a measure of life. “Golf has been a big part of my life since I was a child,“ he says. “When I was young it was a valuable chance for me to spend four hours with my father. He is 85 now and he sees it as a chance to spend four hours with his son. “Now my own son is six now so I hope this is something we will share for some years to come. O’Hurley also happened to meet and woo his wife Lisa on the golf course – at the Phoenix Open in 2003. “Our first date was on a golf course. When I saw her club it 250 yards down the middle of the fairway, I went ‘wow, this is a hell of a date’. We became close friends, so close we got married. O’Hurley has also worked closely with the PGA, hosting events, and with the NBC as a guest analyst. He also hosts two charity events in Samonas and Palm Springs which raise millions of dollars for Child Help and Golfers Against Cancer. He also also produced a number of comedy golfing informercials including Waist Water Golf Pants, Rangé Balls and The Secret to Golf. All of which suggests that this actor is ready to swing away in Greece. Golfers are a peculiar breed. They live and breathe the game, curse it, hail it, read every book about it, invent theories of life based around the magic of the dimpled gobstopper. Just read Michael Murphy’s Golf in the Kingdom, Steven Pressfield’s The Legend of Bagger Vance or John Updike’s Golf Dreams and you will know where I am coming from. George Stephanopoulos is one of those. A lawyer by trade but a golfer by vocation, he has made the move into film production as a creative producer and is the driving force behind Swing Away, the Steven Kampmann-directed movie that will expose the slightly bizarre world of golf in Greece. “Its main theme is the importance of faith, faith in oneself,” explains the 48 year-old who currently resides in New York city. “Yet, faith is a concept that requires a total surrender to a higher power or belief system. And this concept is also true in golf. You see, golf tinged as religion. They just cannot help themselves. Most golfers blame their fathers for their addiction and Stephanopoulos is no different. “My dad taught me to play golf at the age of nine so golf was always seen as a father-son activity,” he explains. Like any good Greek boy he also names and shames Homer and Plato for his conversion. “Yes, I must also credit my enjoyment of golf to two wise Greek philosophers Plato and Homer – only Homer is my Uncle Homer in Phoenix, Arizona and Plato is my Uncle Plato in St Petersburg, Florida. These days Stephanopoulos has less time to study his inner self as he hauls a bag around his local course, Van Cortland Park in the Bronx, New York, the oldest public golf course in the US. “I golf maybe five to ten times a year now. This certainly does not qualify me as a serious golfer. That said, I always have fun when I play even though I struggle with my game. 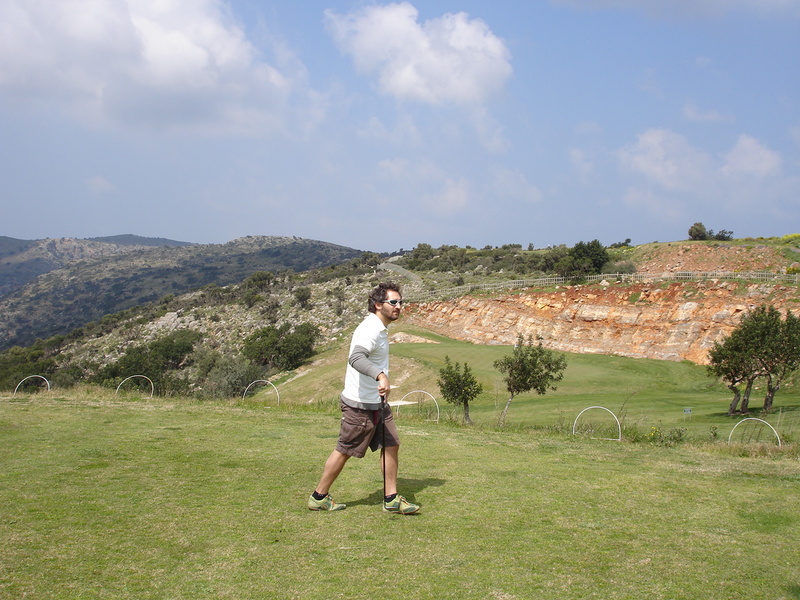 The notion of making a golf film set in Greece may be new to many people but to George. Swing Away has been nearly a decade in gestation. 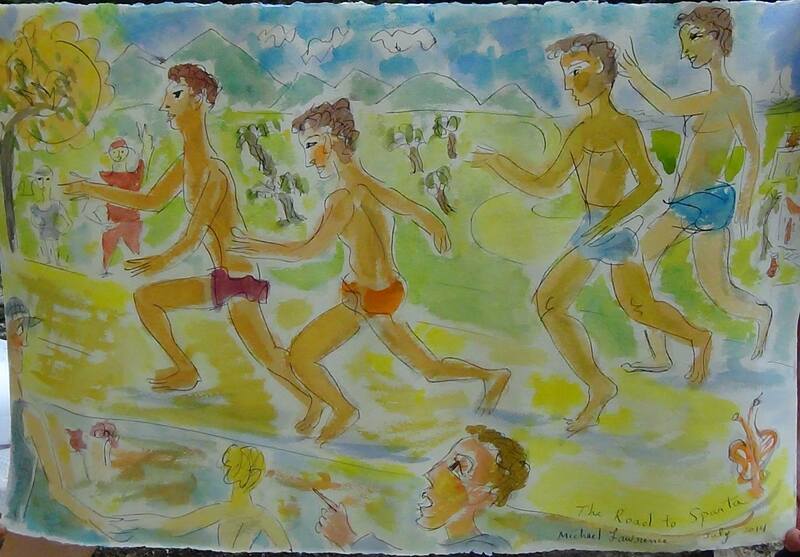 “The idea came to me after the 2004 Athens Olympics,” he says. “At that time I had been looking into opportunities in real estate development and in the process learned that the Greek government was rewriting its laws to attract direct foreign investment for the construction of new golf courses. “That made me want to research the golf market in Greece, which, as I learned, was virtually non-existent especially when compared to Spain and Portugal. “Of course I was on the outside looking in and after a few starts and stops the opportunity I wanted to create for myself in Greece centred on golf and then, thankfully, morphed into a film project. “I say thankfully because I get to do something creative and what better than a movie that offers not just entertainment value but the potential to impact and create social change. George says his main interest is not necessarily to build more courses in Greece in order for the country to promote itself as a golf destination, but rather to ensure that golf has a positive effect on the lives of Greeks even if the sport is going to be developed to cater mainly for foreigners and tourists. The film world is full of starry-eyed dilettantes who dream of red carpets and Oscars night but George is not one of those – a dilettante that is. 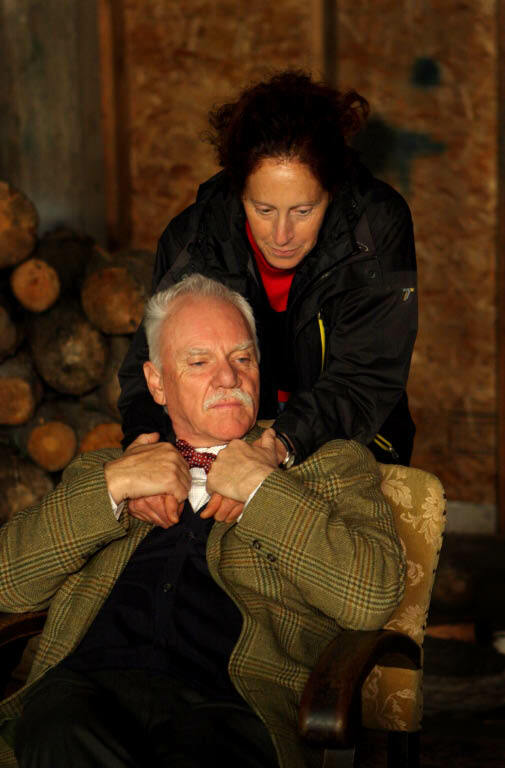 No problem with the shoulder massage but could Malcolm McDowell get a decent cup of tea when filming Golf in the Kingdom? His connection with the cinema started via his briefcase. 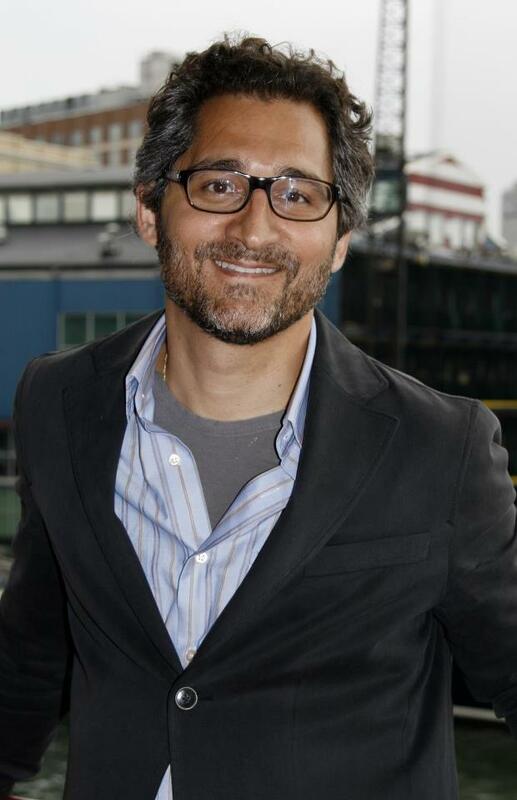 He worked as legal counsel for several independent production and distribution companies, handling the licensing of motion picture rights, legal due diligence, negotiation of talent deals, and other contract matters on such films as Wayne’s World/Wayne’s World II, Lassie: Best Friends are Forever, Lassie, Underdog, VeggieTales: The Pirates Who Don’t Do Anything and the upcoming Lone Ranger feature from Disney and Jerry Bruckheimer. He then stepped up a few rungs of the production ladder, working in a producer capacity on three recent independent films – BuzzKill where he worked alongside Kampmann, Falling Star, aka Goyband and Golf in the Kingdom which saw him not just dealing with the business aspects of the movie but catering as well for Malcolm McDowell. “I tried once to make tea for Malcolm but apparently it wasn’t hot enough or I added too much or too little milk before steeping the tea just right. Time to get out the briki, George, or something stronger for the 19th hole. There is a moment in the movie Big Fat Greek Wedding when Gus Portokalos, the father, explains how every single word in every single language has its roots in Greek, stretching the point to the limit when confronted by the Japanese word kimono. 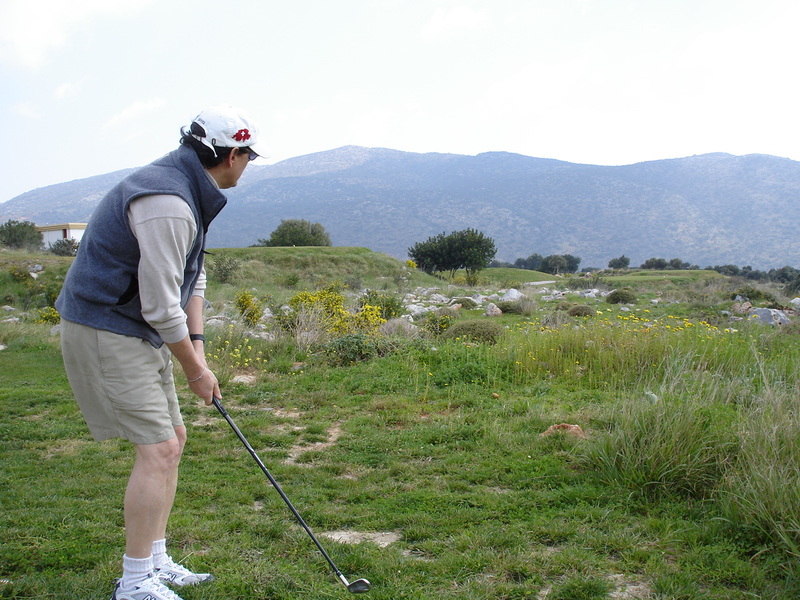 There is a similar moment in the original screenplay of Swing Away, which is due to shoot in Crete in the autumn, when Nikki, the central character, explains how golf is essentially a Greek game, by virtue of the fact that Scotland is really a sub-section of Greece. Not sure the swells at the Royal & Ancient will take too kindly to the rewriting of their sport’s glorious history but cinema goers are sure to enjoy the joke. Swing Away is the offspring of fertile collaboration between producer George Stephanopoulos and screenwriter Paul Lingas – two Greek-Americans who wanted not just to make a great movie but to showcase Greece and highlight the potential of golf in the country. They have since been joined by experienced director Steven Kampmann – who also co-wrote Swing Away and collaborated with Stephanopoulos on the offbeat comedy Second City’s BuzzKill – a couple of leading Greek actors and a distribution company, Picturehouse, that is biting their cohones off to get their hands on what could be the next Big Fat Greek Smash. I first came across George and Paul back in 2007 when they came to play in the Greek Diaspora Tournament at Glyfada Golf Club in Athens and to drum up some initial interest in the movie. The outline of the film was fairly simple. A shamed Greek-American golf pro is kicked off the tour, heads to his grandparents in Crete for a little quiet anonymity. There he discovers Spiros, a ten year-old Greek golf prodigy who swings like Tiger. The pro coaches him, takes a shine to the kid’s mother and … well it would be remiss to give away any more than that except to say it is a feel good comedy with a wonderful golfing climax. Perhaps you could say it is My Big Fat Greek Wedding meets Cool Runnings. Greece, after all is hardly renowned as a golfing haven although it has had a small share of glory; Jack Nicklaus’ caddy was none other than the very Greek Angelo Argea. Steven came on the next trip to Greece. There was at least one uproarious lunch in Plaka when he told some splendid tales of working with Jodie Foster and Mark Harmon on Stealing Home although given these were strictly on the ouzo and off the record, you won’t find them here. Various trips to Crete, Corfu and Rhodes, even to Cyprus, followed to sound out the golf courses but each time logistical problems arose. The script also underwent a facelift, the most dramatic aspect being that the leading man turned into a leading lady. That’s right. It is not just a movie to promote golf but a movie to promote women’s golf. “There have been plenty of films about guys and golf like Tin Cup and Caddyshack but nothing about women,” says Stephanopoulos whose golf movie pedigree is enhanced by his role as executive producer on Golf in the Kingdom, an adaptation of Michael Murphy’s classic book. Stephanopoulos – not to be confused with the former Clinton aide and co-host of Good Morning America of the same name who is in fact his first cousin – and Kampmann have already cast two of the main characters, both of them Greek actors. Nikki’s romantic interest, the father of young Spiros, is to be played by Iraklio-born Manos Gavras while Panyiotis, who does his best to run the golf club under increasingly difficult circumstances, is the highly respected Athens-based actor Renos Haralambidis. The identity of the actress who plays Nikki has yet to be revealed with Stephanopoulos playing his cards close to his chest. 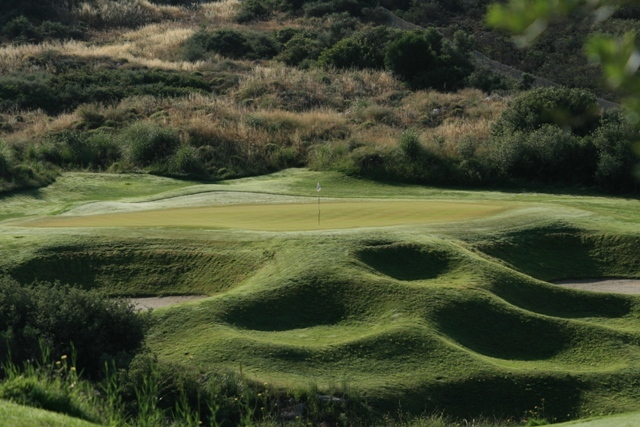 The location is Crete and fittingly the golf sequences will be shot at Crete Golf Club, a decent championship standard course. Much of the comedy will come from the witless attempts of the locals, who should benefit from the course in terms of its increased tourism, both to play the game and deal with Hans Henrich, the peculiar German entrepreneur. Malcolm McDowell, who featured in Golf in the Kingdom and plays a decent round, would be ideal. 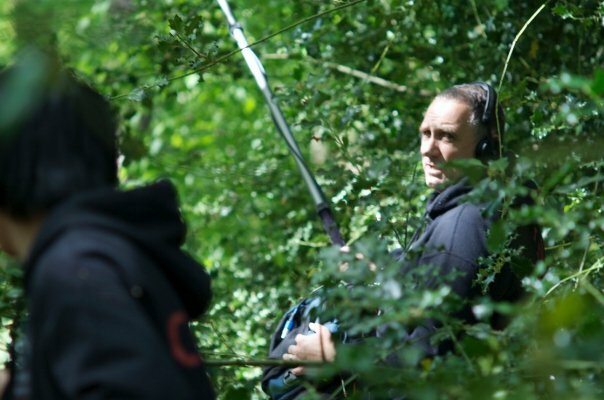 The production is rolling towards its autumn shoot but the producers are still looking for private support. 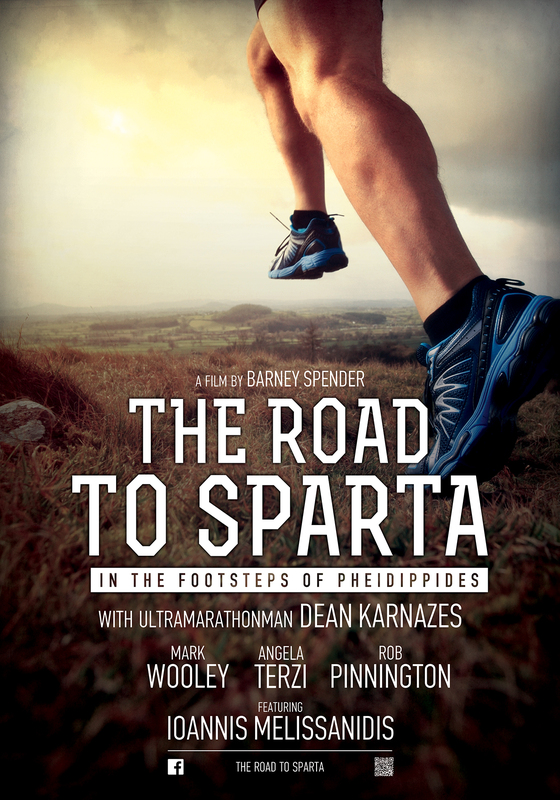 If you want to know more about how to back the project – perhaps even play a small role in the movie – then click here and remember that, along with rugby, cricket, kabadi, tiddlywinks and every other sport and game known to humanity, golf belongs to the Greeks.